Editor’s Note – Foraging is the simplest type of yardfarming! Luckily, public places to forage are becoming more common. Read more to get ideas on how to start a public food forest in your area. This article was posted on Shareable and originally the article and images were from Made Local magazine. Story by Leilani Clark. Photos by Nat and Cody Photography. 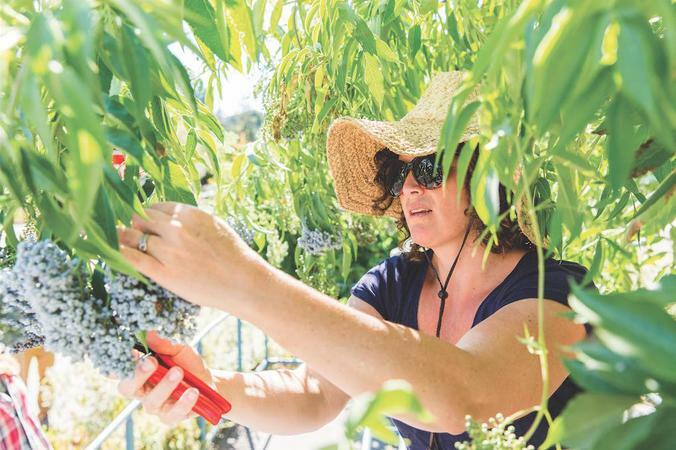 It’s mid-July and, despite months without rain, the berries, herbs, flowers, and fruit trees at the public food forest surrounding the Cavanagh Recreation Center in downtown Petaluma are flourishing. As we brush past pomegranate and fig trees, Trathen Heckman, executive director of Daily Acts, points out two thriving elderberry trees, their hanging branches laden with the tart purple berries used by herbalists for potent elixirs and cordials. “Can I pick one?” I ask, although it feels like I’m stealing. After all, these trees don’t belong to me — they’re on city land. It’s hard to believe that I can help myself to the fruit that isn’t growing on my own property, but the key word here is “public.” The food forest is a place for everyone in the community to utilize. Heckman, an affable 45-year-old with the energy of a teenager, grins widely. “Yes, of course! Come back and harvest some more if you like,” he says. In a time where everything seems to come at a cost, the idea of civically supported free edibles on city property feels abundant, exhilarating, even decadent. Public food forests aren’t too common in Sonoma County — the one at the Cavanagh Center was the first in Northern California — but they are spreading both locally and nationally. Food justice advocates like Ron Finley, best known for spreading the gospel of urban gardens in Los Angeles, have championed public food forests as a way to increase the consumption of healthy foods, food security, and an appreciation for nature and plants in urban and suburban neighborhoods. In Washington, an unruly seven-acre parcel of city land owned by Seattle Public Utilities was transformed into the Beacon Food Forest, the largest of its kind in the nation, where the community can learn about greywater systems, medicinal plants, pruning, and cooking. In addition, low-income families are able to gather herbs and other necessities for their meals, and surplus vegetables and fruit are donated to the local food bank. A food forest mimics a typical woodland ecosystem with layers of trees, shrubs, vines and groundcovers, but, in this case, almost everything is edible. At Cavanagh, I see fruit and nut trees at the upper level and berry shrubs, edible perennials, and annuals at the lower levels. “Many yards already contain most of the elements of a forest garden: a few tall trees in front or at the back edge, some shrubs for hedge or berries, a vegetable path, a few herbs, and a flower bed. But in the typical yard, these elements lie separate and disconnected. A forest garden simply integrates all of these pieces into a smoothly working whole,” writes Toby Hemenway in Gaia’s Garden: A Guide to Home-Scale Permaculture. For example, trees of various sizes are hugely important in the typical food forest, just as you would expect in a natural woodland. Hemenway describes it as a seven-story garden with tall trees, low trees, shrubs, herbs, ground cover, roots, and vines, where the emphasis is on edible perennials rather than annuals. It’s not a new concept, says Heckman, but it’s an idea worth bringing into the larger public consciousness. According to Edible Forest Gardens by Dave Jacke and Eric Toensmeier, a true food forest is resilient, diverse, functionally connected, self-renewing, self-fertilizing, solar-powered, and rich in food, habitat, and herbal medicine. It’s a way of getting out from under what they term a “monoculture mindset,” in which elements in a system don’t connect to each other. Food forests emphasize cooperation between all elements. “We can consciously apply the principles of ecology to the design of home-scale gardens that mimic forest ecosystem structure and function, but grow food, fuel, fiber, fodder, fertilizer, ‘farmaceuticals’ and fun,” writes Jacke on his website. You can see this in action at the Cavanagh food forest where most elements serve multiple purposes — food for humans, forage for pollinators, habitat for birds and insects, shade coverage for shade-loving plants. Some plants are nitrogen fixers, which means they create their own fertilizer, benefiting and strengthening the plants around them. Back in 2009, the 3,500 square-foot space was a water-thirsty lawn. That’s when 150 volunteers from Daily Acts came in and transformed it in only three days. Using pro bono designs by local ecological designers Erik Ohlsen and Patrick Picard, the volunteers sheet mulched, installed drip irrigation and a rainwater harvesting system, and planted edible, medicinal, and habitat-providing plants. They also built swales — shallow trenches dug along the contours of the land for rain catchment. The Petaluma city government partnered with Daily Acts, paying installation fees while the nonprofit agreed to coordinate educational programs and stewardship days where volunteers can learn to prune fruit trees, make herbal medicine, and complete maintenance tasks. The partnership appears to have paid off: The City of Petaluma has saved 65,000 gallons of water and $25,000 in maintenance costs a year, according to data from Daily Acts. Public food forests also seem to positively impact the surrounding neighbors. Some even decide to switch over their own lawns. Tiffany Reneé, a former vice-mayor of Petaluma, lives a couple of blocks from the Cavanagh food forest. She volunteered with the Daily Acts team that transformed the space, which gave her hands-on practice in sheet mulching, building beneficial plant guilds (a permaculture term for companion planting) and water catchments. Inspired to learn more, Reneé completed a six-month permaculture design course through Daily Acts. Two years ago, she and her partner moved into a rental house. With the approval of the landlord, they’ve transformed their front yard into an edible oasis of fruit trees, shrubs, herbs, ground covers, and bee-hives. For them, the food forest approach has actually cut down on maintenance. “It’s a layered system that in many ways tends to itself and requires a minimal effort to produce quite a bit of food,” says Reneé. Not only do she and her partner benefit from the production of more food with less work, it also opens up conversations with neighbors who walk by and ask about the lively front yard buzzing with pollinators. Thanks to the work of Daily Acts in partnership with the cities of Cotati, Sebastopol, and Windsor, along with local colleges and high schools, public food forests are spreading throughout the county. In 2012, community volunteers, alongside Permaculture Artisans and students from Windsor High School, transformed a lawn at Robbins Park in Windsor into a food forest, saving the city about 70,000 gallons of water a year, according to Daily Acts. A similar partnership built Cotati’s Pocket Park, a public food forest in a residential area near a walking trail and a creek restoration project. In 2015, a section of lawn at Santa Rosa Junior College’s Petaluma campus was transformed into an outdoor learning lab with fruit trees and 150 drought-tolerant and multifunctional, habitat-providing ground covers, shrubs, and native plants. Over in Sebastopol, a similar team transformed the tired landscaping around the library and city hall into a thriving edible ecosystem and habitat. The city calls the project “Our Front Yard.” Mayor Sarah Glade Gurney says that the impact on the community was greater than she initially anticipated. Back at the Cavanagh Center, the tour with Heckman winds to an end, and it’s hard not to wonder what would happen if funding for public food forests became easier and the concept could be scaled up. For all the love now, in Sebastopol, it was a challenge to get community donations for their public food forest. To ensure the project’s success, the city council stepped up the funding through two budget cycles. Are other cities in Sonoma County willing to set aside money from squeezed budgets to do something similar? Still, it’s easy to imagine public food forests, large and small, in every neighborhood. What if edible, drought-friendly, habitat-creating public landscapes were prioritized in the county? What might that look like? How would that impact food security? Our sense of community? How about our children’s connections to the natural world and the processes by which food grows? Heckman doesn’t think the concept is too far-fetched.